Here you can see different methods to download Tumblr video and save them on your Android, iOS and Windows device for later offline viewing. 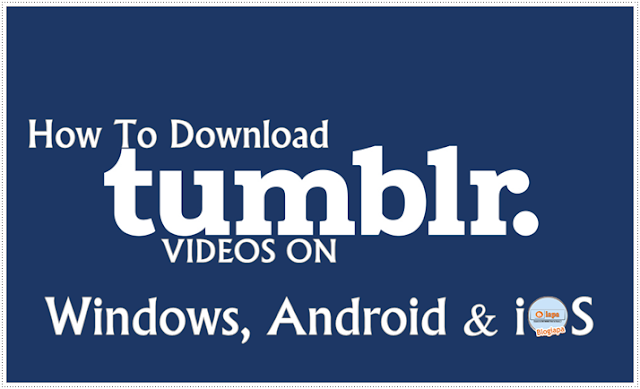 Here we're going to share various useful tools to download videos from Tumblr on your Windows, Android or iOS device. Also, see how to save videos downloaded from your Tumble account on Windows PC, iOS and Android-powered smartphone or tablet directly by using the instructions given below in this post. Tumblr is one of the biggest social networks in the world. Peoples use Tumblr looking for funny and interesting video clips, GIFs, and photos. If you have been wondering whether "Can I download this video?" or "How to Download Videos?" from Tumblr, then you are at the right place. You can definitely download videos from your Tumblr account & save them to watch offline. So keep on reading to learn how to download & save videos from Tumblr account directly onto your Android, iOS, and Windows-powered desktop/laptop. There are various tools available that can be used to download videos from Tumblr very easily. Here we are are going to mention the most popular and easy-to-use tools to download Tumblr videos in original format & quality. Download the Orbit Downloader app and install it on your Windows device. Go to the Orbit Downloader's Tools menu and click on Grab++ option. Open Tumblr site on your device and search for the desired video. Grab++ will fetch the video while it's being played on your device. When the URL of the Tumblr video appears in the Grab++ list, click on Download button. Browse through the Tumblr website. Make sure that you are logged in with your account. Launch the software tool on your computer after which it will automatically detect the Tumblr ID during scanning. Now download a video, select that specific ID & add it to the download list. You can then access videos & photos from the download folder which will pop up at the end of the process. It is an online source that allows you to download Tumblr videos in popular MP3 / MP4 format. Fetch the URL of the Tumblr video that you wish to download by copying it from the address bar. Now paste the URL in the blank space when it says Enter Tumblr video URL. Select the desired download format such as MP3 / MP4 or MKV. Wait for the video to download. It is an online tool that is easy to use for Downloading & Saving Tumblr videos. Moreover, this tool allows you to even download private videos. Open the Tumblr site on your device. Next, click on the desired video that you wish to download & get its URL from the address bar. Now paste the URL in the black space on the DreDown page and click on the DreDown button next to it. It will start to download your video. TubeNinja is an online site that offers two ways to download and save videos from your Tumblr account. Go to TubeNinja and open a new tab. Copy the URL of the video you that want to download from Tumblr. Back in TubeNinja, at the top of the new tab page, you will see an empty box where you need to paste the URL. Next Hit the Download button. On the next page, select the video quality after which the download will start. Go to the Tumblr video. At the address bar of the video find Tumblr and add dl in front of ‘Tumblr’ in the address bar. Android users can use any of the two apps below to download and save Tumblr videos. Go to the Google Play Store and download the official Tumblr App or manually install it using Tumblr APK. Launch the Tumblr app & search desired video or GIF to download. Tap on the Share button located at the top of the post that will give you multiple options from where you need to select Tumblr Video Downloader. The app will now automatically download the desired video. All you have to do is to click on Download video or Download GIF option. This multipurpose app can be used to download videos from different social networks such as Facebook, Tumblr, Instagram, and others. Download Social Video Downloader from the Play Store. Launch the app & click on the Play Button next to the corresponding video to start downloading it onto your device. Download the Dwndlr Package and install it on your iOS device. Open the Tumblr video which you want to download. While the video is playing, tap & hold on the video. After a few seconds, a message will pop up prompting you to confirm whether you want to save that video or not. Tap YES to download & save selected video directly to Camera Roll. Hopefully, above mentioned apps & tools proved helpful to you in downloading and saving videos, photos, and GIFs from Tumblr. Enjoy and don't forget to share this post with friends.